If you are a Turkish citizen who lives abroad and want to keep up with the hometown, you can create a YurtdisiPlay account and watch the content on the go with your iPhone or iPad. Just log in to YurtdisiPlay iOS app and take all the movies, TV shows, live TV channels and live sports events with you wherever you go. High quality action from Turkish football and basketball organizations. 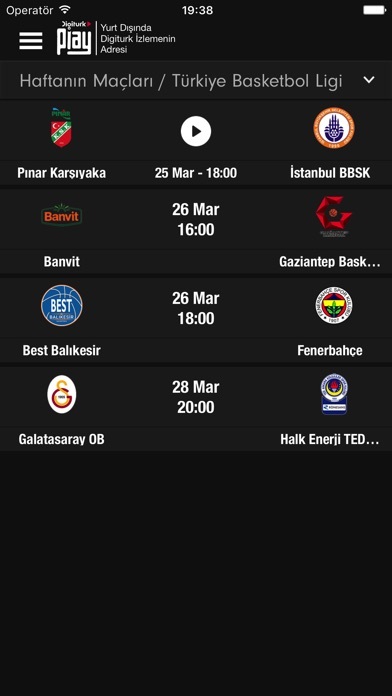 Watch any match of Turkish SporToto Super League or Turkish Basketball Super League organizations live in the app. Watch any movie or TV show in Digiturk’s selection of on demand content. It’s added to the collection when it’s shown on a selected national TV channel. Do you feel to watch the show on a big, old, comfortable TV screen? You can send the movie or TV show playing on your phone or tablet to your TV screen via Apple’s AirPlay or Google’s Chromecast technology and enjoy it on the big screen.